Home » Posts » Attentionology for K-5 Teachers » Turn Your Classroom into Discovery Place! Fill your Classroom Discovery Place with simple, colorful inviting items. Daily routines are mandatory for classroom management in any grade, but by the end of the school year or term, routines can become boring, sapping energy out of teachers and students alike! Why not “break away” for part of a school day and turn students loose in your Classroom Discovery Place! A Discovery Place doesn’t have to be fancy or require a lot of work to design and prepare for student use. 4) Leave activity cards (see suggested activities below) and some blank cards (for kids to write their own activity plans) in a basket in Discovery Place. 6) Cover Discovery Place with a large piece of fabric and attach a Please Do Not Disturb sign to the fabric. This may catch kids’ attention; good! You’ll create interest in the new addition to your classroom before you even introduce it to the class. When you’re ready, unveil your Classroom Discovery Place with a fanfare! Play music. Ask a student volunteer to help you remove the Please Do Not Disturb sign to reveal Discovery Place. Tell your class that you’ve added something new to the room to give it a fresh feeling as the end of the school term draws near. …Science – Pick up a cardboard scrap that you’ve put in your Discovery Place. Tell the class that they can choose to re-use found objects, like the cardboard scraps as part of their environmental education. Elaborate on this opportunity with your own narrative; here’s mine. I recently showed a class a big round piece of cardboard I found over a weekend at a home improvement store. It was on the ground near the pine straw truck and the store employee nodded his okay when I inquired about taking the big circle home. I told my class that I planned to turn the big cardboard circle into a giant clock to use for storytelling time. 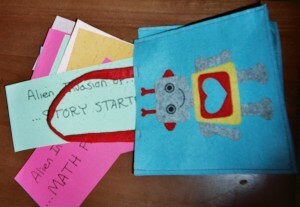 Tuck story starter cards in an old felt bag in your Classroom Discovery Place. …Writing – Pull a story starter card out of an old felt bag that you found in a closet. Hold the card up and suggest to the class that they can stop by Discovery Place to find good ideas for writing. …Reading – Pick up an old book that you’ve put in your Discovery Place. 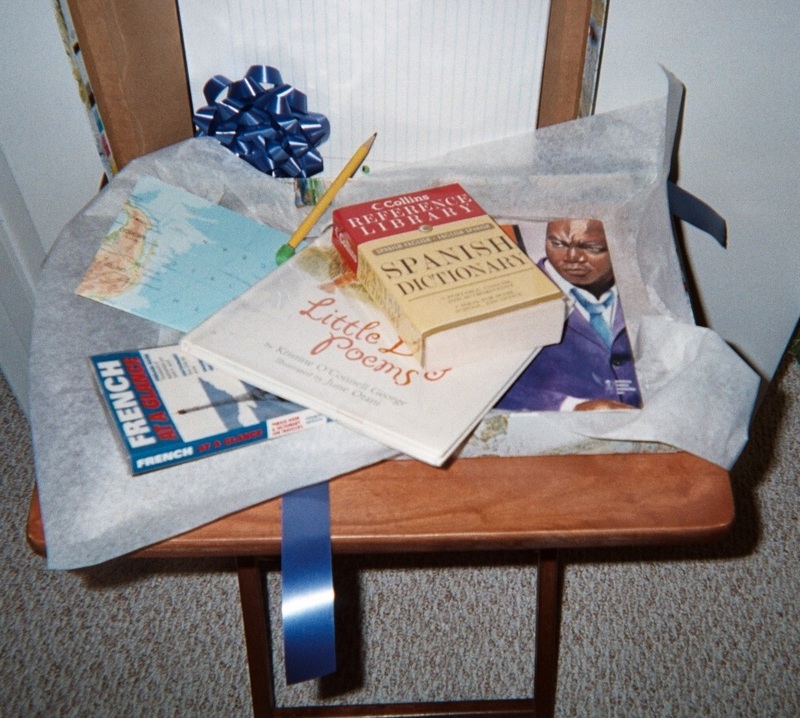 Share the pleasure of tapping into one’s family history by bringing an old book to class – maybe one that you found hidden in an old box in the attic or a loved one’s home. Engage students’ interest with your own personal narrative. For example, I have my grandmother’s book of poetry on a shelf next to my desk. It was a gift to her from my great-grandfather. My students’ eyes grow big when I tell them how old this book is. Then I challenge them to find the oldest book in their own home. I ask students to write down the title, author, publisher, year of publication, and if possible, borrow the book to bring to school. This book-based activity in Discovery Place is a great way to help third – fifth graders make a connection with history and social studies. Tell students that Discovery Place belongs to the whole class! Invite them to bring items to add to what’s already there. Keep it simple. In a world full of distractions, it sometimes seems that children today (and adults) are too busy to pause and savor simple but special discoveries together. When we do, we can help children develop the ability to pay attention. 1. Cut out a cardboard circle or square. 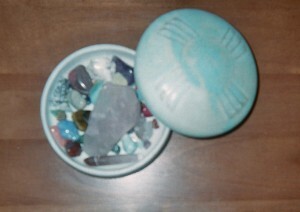 Glue small pebbles to the shape to make pebble art. Punch a hole at the top to hang up the art. Invite kids to pick out the smallest pebbles and stones they can find to glue to a cardboard shape to make pebble art. 2. Make cardboard animal sculptures. Draw an animal shape on a piece of cardboard. Cut out the legs as separate pieces from the body, head and tail of the animal. Fold the four end of the legs at their tops to make tabs. Tape the leg tabs to the body, two on one side, two on the other. Stand up the animal sculpture. 4. Cut small squares from old magazines and separate the pieces by color, keeping them in ice tray compartments. Draw picture on a blank piece of construction paper. Fill in the sections of the picture by gluing paper squares in place, choosing colors to make the picture realistic or fantastic. 5. Cut out a paper sun, planets and moons in the Solar System using different colors of construction paper. Glue them to a large piece of paper showing their distance from the sun. Optional: Follow the same steps but make an imaginary solar system. 6. Cut pieces of yarn and glue them to a piece of construction paper to make a picture. For example, bend the yarn to form the shape of a person. You may already have a learning center in your classroom similar to Discovery Place. If so, add any items and activities you like in this post to “jazz up” your center and spark new interest in it. I’d love to get a comment about your Discovery Place. …The joy of learning is to know that when we take time to stop, look and listen to the world around us, we can make new discoveries every day. Doing so trains the brain to be alert, pay attention, and be open to what’s new – all important skills for the 21st century! 5 Pings/Trackbacks for "Turn Your Classroom into Discovery Place!"